We offer an array of makeup services using Jane Iredale mineral makeup. This amazing mineral makeup looks natural and feels incredibly light. There is simply no comparison! Whether you have a special event to go to or you just want to try it all out, one of our skin care professionals can help you find the perfect shades and make helpful recommendations based on your skin tone, eye color, and personal preferences. With your first application, you will see what makes this mineral makeup so different from the rest! See our Jane Iredale page for available cosmetics and details. Makeup consultations do not include a full makeup application, but are absolutely free! 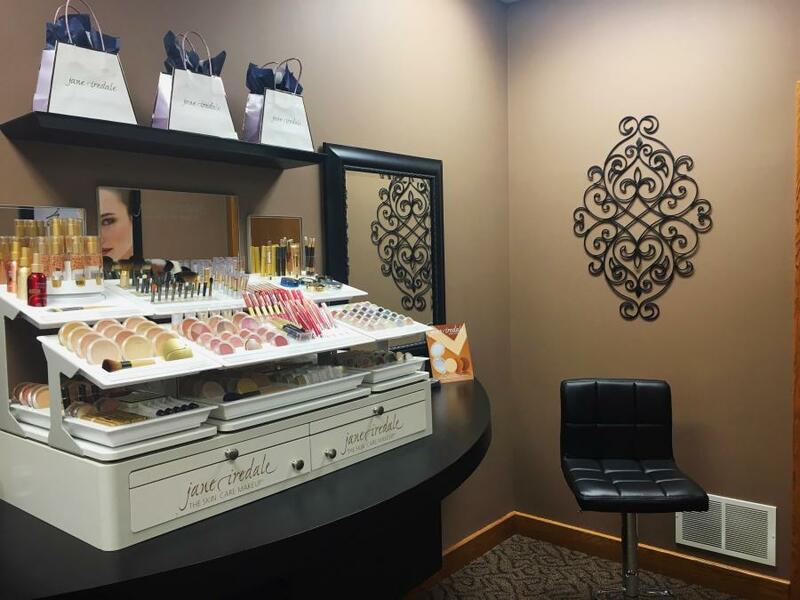 During a makeup consultation or color matching session, we will discuss your needs and what you'd like to try, we can color match and make helpful recommendations based on your skin tone, eye color, and personal preferences. We are happy to let you try anything before purchasing. Makeup consultations are a great way to explore what Jane Iredale has to offer and give you the opportunity to ask questions and try any cosmetics that you may be interested in. We always document your favorite items so that we know exactly what you need when you are ready to make a product purchase. A full application of Jane Iredale mineral makeup accompanied with personalized and detailed application instructions and tips. A skin care professional will discuss your needs and preferences to recommend and use cosmetics products that best suit your skin type and condition. Detailed instructions will be provided as we apply a primer and foundation as well as the finishing touches to the eyes, cheeks, & lips. We would be honored to provide makeup services for your special event at our office or by traveling to your event location. A deposit is required to secure all event appointments. A travel fee may be charged if the event location is further than 8 miles away. Includes the Pre-Event Trial Session, Full Special Occasion application, and False Lash Application. › Products are FREE of bismuth oxychloride, an acne causing ingredient. › Milled so fine that NO BUFFING is needed when applying. › Jane Iredale is the #1 CHOICE of dermatologists and plastic surgeons. › Products are good for ALL SKIN TYPES. › You have THREE choices for BASE – liquid, loose, pressed. › PRESSED powder eyeshadow for EASY placement and NO mess. › NO filler, 100% PURE minerals. › Concealer, foundation, powder, and sunscreen ALL IN ONE product! › Jane Iredale products are NON-TOXIC and HYPO-ALLERGENIC. Absolutely! We are so proud to offer the complete Jane Iredale line, and we have testers for everything we stock. We ensure all of our testers are kept fresh and extremely clean and sanitary; we have everything you need to try it without a worry! We often encourage you to try it out and feel it on your skin - even wear it for the day before making any purchases. If you aren't completely satisfied with the way the makeup feels or wears, PLEASE TELL US and we can try something else - you have options! Trying a different product or going over how to apply it again or changing your method of application can often help. This makeup is very easy to use and apply, but certain products do require the right tool and technique! Although many people immediately fall in love with Jane Iredale mineral cosmetics, you should never feel obligated to purchase anything. "My skin was breaking out all the time with every makeup I tried. I finally tried Jane Iredale, and I absolutely love it. I can't believe what a difference just changing my makeup has made - I hardly break out at all. I love the way it feels, that it's super easy to use and that the makeup won't clog my pores." "I had been using Jane for a few years and was always frustrated with the way it was wearing on my oily skin. I tried other makeup brands here and there but always went back to using Jane because it was better. I started coming to New Skinsations and told them how I felt about my makeup and what I was using. She completely changed what I was using, and now I love how it's wearing! I didn't know there were other foundation options, and that the person who introduced me to the brand somewhere else had recommended all the wrong products for my skin type. I highly recommend New Skinsations for their product knowledge and more. She also addressed a few of my other concerns and showed me how to apply everything correctly. I am so happy with my makeup!" "I used to settle for cheaper makeup, I just figured why pay more? I didn't really realize how heavy and chalky it felt, how uneven the coverage was, and the fact that it never really lasted through the day until I tried the Jane Iredale makeup. I guess I just thought most makeup was that way. I could immediately tell a huge difference when I tried Jane Iredale! I hardly feel like I’m wearing any makeup, I have fewer breakouts, and it lasts all day without having to touch up. When I look in the mirror at my smooth skin, I know I will never use another makeup... the coverage is amazing, it feels great and looks so natural and flawless. It is most definitely worth paying a little extra!" Please give at least 24 hours notice for appointment cancellations. Please note that although we do our best to keep our website up to date, prices are subject to change without notice.